Walt Disney World has lots of entertainment options for everyone in the family. One of those options that you may not think about are the various lounges located around the resort property in resorts, Disney Springs and the theme parks. Many of these lounges specialize in offering great entertainment to their guests along with the general atmosphere and drinks. Some of the lounges even allow children until certain times of night and provide family-friendly entertainment. Here are my 8 choices for the best lounges for entertainment at Walt Disney World. This new “joint” at Disney Springs is themed as a speakeasy from the early part of the 20th Century during the prohibition era. The lounge is located under Maria & Enzo’s restaurant in a “storied rum runner tunnel.” The entertainment here comes from the music, bartenders and the general atmosphere keeping to that prohibition era theme (note the graffiti). There is a large selection of scotches and rums, and the Roman style Italian food served is quite good. Staying at Disney Springs, my next choice is Raglan Road. This pub atmosphere is imported straight from Ireland—did you know that Raglan Road Pub was built in Ireland, then shipped to Orlando to be reconstructed? It is that authentic. Here you will find live music 7 nights a week, Irish dancing, and then “One Heck of a Hooley” from 7pm-10pm. (A hooley is an Irish word for a party, but attending it will leave no doubt in your mind what it is). The energetic spirit of these celebrations of Irish culture come together with some amazing drink and food options to make Raglan Road a perennial guest favorite. Located in the Grand Floridian Resort, Mizner’s Lounge has a much more subdued form of entertainment compared to Raglan Road. Mizner’s is located just behind the band stand for the Grand Floridian Society Orchestra, so if you are visiting at a time when they are playing you are in for a treat of some wonderful live music. The Top of the World Lounge is located at the top of Bay Lake Tower and offers panoramic views of the Magic Kingdom and Bay Lake area that are absolutely breathtaking. And it is bar none one of the best out of the park places to watch the nightly fireworks. That makes for some great entertainment. Unfortunately for non-members, only Disney Vacation Club Members and their guests can go up to the lounge. So, for a backup, check out the lounge area at the California Grill at the top of the Contemporary Tower. The River Roost Lounge at Disney’s Port Orleans Riverside is a family favorite for live entertainment. 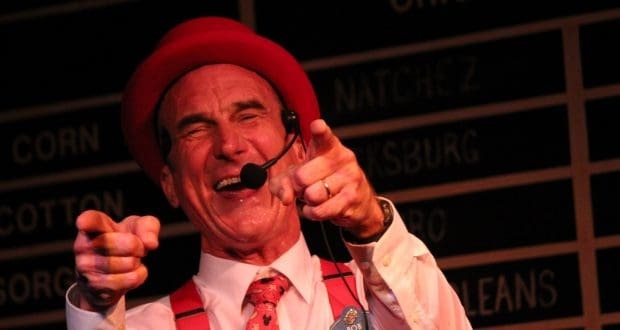 Here you will find the legendary Yee Haa Bob performing on select days of the week (be sure to check his website for his current calendar before planning your evening there). Arrive early to get a seat at a table, or even to be able to squeeze in for standing room. Yee Haa Bob’s family friendly musical entertainment packs in the crowds. If you are staying at one of the Port Orleans resorts you definitely need to walk over one evening to take part in the fun, but even if you are not it is worth the trip. Located in Disney’s Polynesian Resort, Trader Sam’s Grog Grotto & Tiki Bar has sort of two areas. Outside you can have a sit al fresco and enjoy drinks and some live music (and some great sunset views). Inside there is more of a show complete with audio animatronics and special effects. The drink that you order kicks off a reaction from the inhabitants of the lounge. Think of it as the Tiki Room enhanced with food and beverage. This is a very fun place to visit, and until 8:00pm children are welcome (after 8pm it is 21 and over only). The Edison at Disney Springs is set in a 1920s electric company. It has a steam-punk vibe that celebrates invention and imagination. Inside there are multiple themed areas including the Tesla Lounge, The Patent Office and the Telegraph Lounge. The entertainment here almost more like being in Las Vegas than in Walt Disney World with DJs, aerialists, contortionists and a live cabaret. Before 10:00pm anyone is welcome, after 10pm it is 21 and over only and there is a dress code. Jellyrolls on the Boardwalk at Disney’s Boardwalk Resort is a perennial favorite for evening entertainment in a lounge atmosphere. The dueling piano bar is high energy and so much fun to visit, especially when you are there with a group. The musicians are very talented and take your requests—I have not seen anyone stump them yet. Jellyrolls is 21 and over only and there is a cover charge. You have to try Jellyrolls on your next “grown up” evening at Walt Disney World. Walt Disney World has some amazing lounges—which ones are your favorite for entertainment?